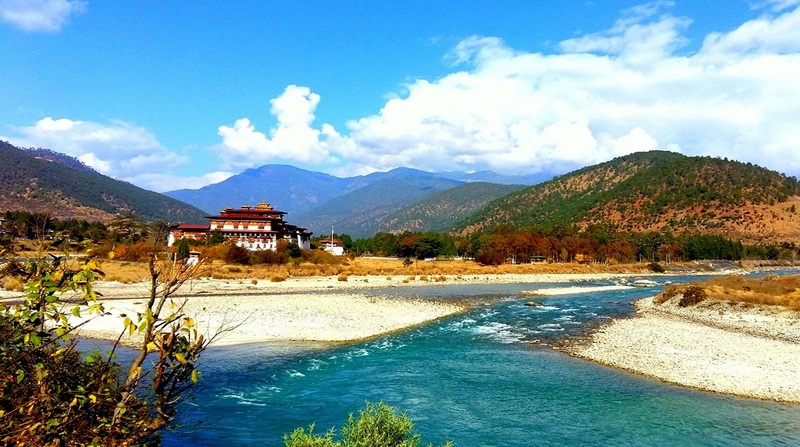 Punakha Dzong and then cross the Pho Chu (Pho-Chu means male river), the river that drains remote Lunana region. You will have a steady half-day climb into a forest of scattered long needle Cheri pine. Make sure to fill your water bottle before leaving Punakha. Your Arrival at PARO Airport. Transfer to hotel. Overnight in hotel. Day 02: PARO – THIMPHU. This morning follow the winding road beside the Pa Chu (Chu Means River or water) downstream to its confluence with the Wang Chu then up-valley to Thimphu. Lunch at the hotel. Afternoon visit Memorial Chorten of late King and stroll in town. Overnight in hotel. Day 03: THIMPHU – SHONG PANG [Trekking]. 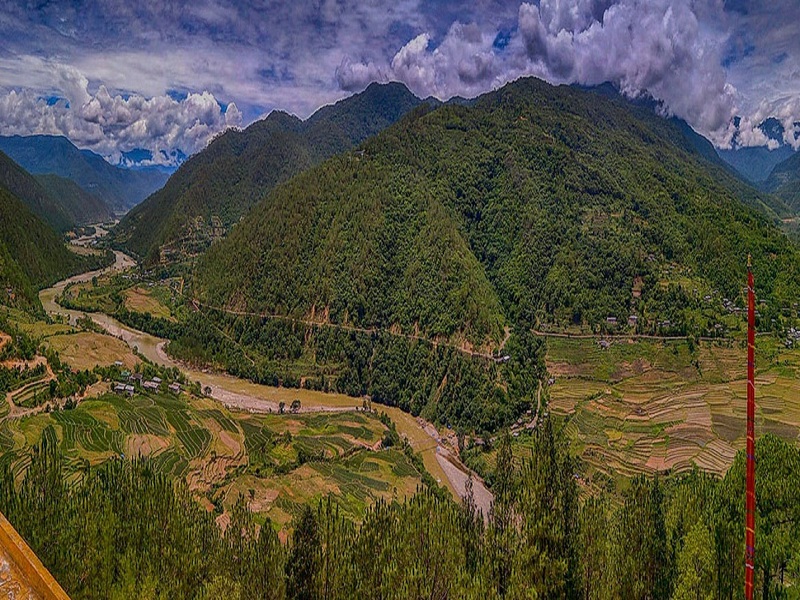 Drive north up the valley towards Dechencholing Palace (the residence of the Queen Mother) following the Thimphu Chu, the transport will reach you up to Pangrizampa the last motor road point. From here the trek starts towards Shong Pang which takes about 4/5 hours through the village and the vegetation. On the way, you can see blue pine, oak spices, Rhododendrons etc. Overnight in camp. Day 04: SHONG PANG – DOPSHING PANG [Trekking]. The trail trek ascends gradually up till you reach the pass called Sinchula, which is about 3,490m. From this, if the weather is clear one can see Phajoding monastery. After the 2Km walk, you can view Thinley-Gang village, Talo Monastery and the high way towards the ancient capital of Bhutan. The trek from the pass is more or less descends till you reach to camp. Overnight in hotel. Day 05: DOPSHING PANG – CHORTEN NINGPO [Trekking]. Today the trek to Chorten Ningpo is rather gradual and will be walking into thick forests and afternoon before you reach to the camp you will pass by the villages and rice field. Overnight in camp. Alt. 2,700m. Day 06: CHORTEN NINGPO – ZOMLINGTHANG [Trekking]. For about 2/3 hours the trek trail will be through the villages and then you will reach to the motor road. 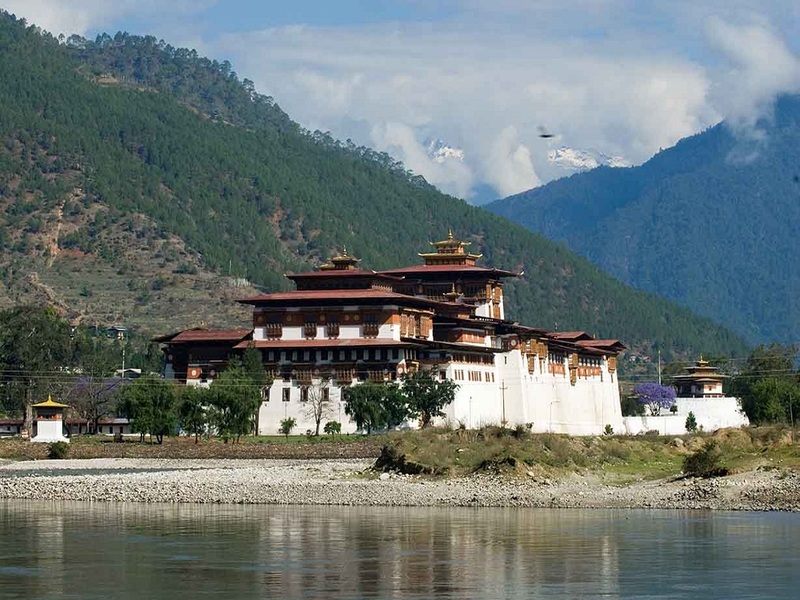 Follow the road towards Punakha that is the ancient capital of Bhutan. Evening at leisure and those who are interested can fish in MoChu (Mo-Chu means Female River). Day 07: ZOMLINGTHANG – LIMBUKHA [Trekking]. 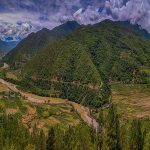 Follow the motor road till Punakha Dzong and then cross the Pho Chu (Pho-Chu means male river), the river that drains remote Lunana region. You will have a steady half-day climb into a forest of scattered long needle Cheri pine. Make sure to fill your water bottle before leaving Punakha, as there is no water on the way for a couple of hours. You will have a wonderful view of Punakha valley and Dzong. If the weather is clear you can see some snow mountains towards the north. The camp is near the Limukha village. Alt. 2,250m. Day 08: LIMBUKHA – CHUNGSAKHA [Trekking] – WANGDI. The trek ascends gradually up through the thick forest of oak spices and Rhododendrons till you reach a pass called Do-Chula. Then descend through the thick forest till you reach a small monastery dedicated to a lama called Drukpa Kuenley. Then from Chungsakha, you can look across the valley to Samtengang on the ridge to the south. Walk downhill till you reach the motor road and then drive for about half an hour to Wangdi. Overnight in Wangdi Guest House. Day 09: WANGDI – THIMPHU. After breakfast drive to Punakha Dzong. It was Bhutan’s capital until 1966. The Je-Khenpo, head abbot of the religion in the country and most of the monks of Thimphu occupy this Dzong throughout the winter since the lower elevation of this valley has a more comfortable temperature. Return drive over the Do-Chula pass, alt. 10,000 ft. Stopover at Do-Chula cafe for a cup of hot tea/coffee and snacks. If the weather is clear you will have beautiful views of the Himalayan Mountains. Continue drive to Thimphu. Afternoon some sightseeing and shopping. Overnight in hotel. Day 10: THIMPHU – PARO [Departure]. Early morning drive to Paro Airport for your onward departure flight.